Naming Rights $20 million for 20 years. The Scotiabank Saddledome (formerly the Pengrowth Saddledome) opened in 1983 and hosted the 1988 Winter Olympics. It was the first building in North America to make room for the larger, international-sized surface. Designers added 6,000 acoustic tiles to the concrete roof panels, making for a great concert sound. Yet the tiles also muffle the crowd noise at a building where the fans already tend to be pretty quiet. March 3, 2001 - The Saddledome was opened in 1983 and was a host venue to the 1988 Olympic Winter Games in Calgary, but to look at this venue from the outside one would think it is one of the newer showcases - bright, modern, and an architectural design which is distinctive and unique as far as the buildings we have seen. As the name indicates, the roof of the building is shaped like a saddle, with the highest points of the building located not in the center, but at the edges. This arena is located in Stampede Park on the fringes of downtown Calgary, which is also home to the world famous Calgary Stampede. Right next door is the Corral, a 7200 seat hockey arena which for two seasons was the first home of the Flames in Calgary. We toured this building and found it to be very shabby and in great disrepair, but the old exhibits and photos in the concourse were some thing to be truly marveled! The complex has ample parking and is also served by a light rail rapid transit station. Unfortunately the trains weren't running on this weekend due to a transit strike! The Saddledome underwent significant renovations in the mid 90's and the result shows! The building is beautiful - multiple concourses which are incredibly wide and spacious along the sidelines, several restaurants and bars located in various parts of the building, an Air Canada Club concourse at ground level, and a terrific array of exhibits throughout the concourses displaying the construction of the arena, the '88 Winter Olympic Games, Alberta inductees into the Hockey Hall of Fame, and the Flames run for the Stanley Cup just to name a few. This is a beautiful arena bowl with an attractive coordinated color scheme of medium green, medium blue and wine red seats. The lower level only goes some 18 rows up, so the first few rows in the balcony are really the prime seats in the building. A ring of suites lines the top of the lower level along the sidelines and skyboxes hang from the top of the arena. The scoreboard is 8 sided, with 4 panels bearing Jumbotron video boards and the other 4 dot matrix panels and stationary ad panels. The balcony is surrounded with stationary ad panels and message boards. Lastly, above the skysuites are backlit canopy ad panels hanging high above the arena. Another thing we want to point out is the scaffolding and catwalks under the roof of the arena. In most places this sort of thing is an afterthought, an evil necessity that is just there and hopefully not too noticable. At the Saddledome, the gangplanks and pipes are painted blue and red to match the seat colors, and actually blend into the bowl's aesthetics quite nicely. Very well done! The pregame show here doesn't touch the extravaganza in Edmonton, but they do have something truly unique here - suspended high above each blue line is a white box. Each time the Flames score a goal a huge burst of flames lights up the sky above the ice. Really cool! "That Good Ole' Hockey Game". Cool song, right? We do it in Buffalo, but nothing like here in Calgary. They put this song on during a media timeout in the 3rd period, to the video accompaniment of great Canada Cup and Canada Olympic hockey moments. Everyone was singing - EVERYBODY. And clapping, too! As usual, the timeout wasn't long enough for the song to finish. That was too bad. These Calgary fans deserved to give themselves a big round of applause! A wide variety of national chains, including Tim Hortons, and a varied menu selection makes this a good place to go if one is hungry. There is no "team store" but there are two huge merchandise sale areas in the two sideline concourses. We did mention the number of restuarants and bars in the building, and on the terrace level above each sideline concourse were full service bars overlooking the main concourse and views to the outside. 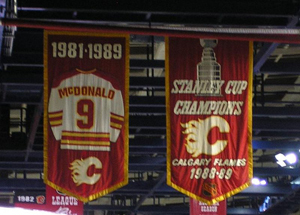 Their one Stanley Cup banner is accompanied by their various division and conference titles, along with one retired number, that being Lanny McDonald. A banner hung in 2000 says "Fans #1", probably to honor the faithful in coming through for a season ticket drive to keep the team here. Normally we HATE these things, but I guess some accommodations can be allowed in this case. Hey Minnesota! You guys also have a banner claiming that Wild fans are "#1"! We guess you guys are gonna have to arm wrestle or have a bikini contest or something to settle this issue. When our journey is complete, our trip to Alberta will most likely stand out as one of the extraordinary ones... the folks in Edmonton and Calgary were warm and hospitable, the cities were beautiful, like a piece of Texas in Canada, and the hockey experiences were outstanding. We promised everyone a return visit should our Sabres compete in the Stanley Cup finals against one of these teams... the way things have been going, it may be Edmonton in this year's finals, riding a 30 game winning streak that began in February!!! The Calgary Flames are continuing work in planning a replacement for the Pengrowth Saddledome. The latest plan being examined calls for razing the existing venue to make space for another arena. The new building would be built adjacent to the Saddledome. While there is no firm time line for rebuilding, the team hopes to make the move within the next decade. The current lease expires in 2014. While the new building wouldn't be larger, it would include improved facilities for training and team offices. It would also upgrade fan amenities and offer new premium seating options. The Saddledome completed a CAN$32 million upgrade in 1995, which included up to CAN$12 million in public money, refitting much of the its interior, opening up the public concourse area and adding luxury suites and Presidents' Club seating. The team hopes to pay for much of the new building with private money. The building was opened in 1983 and the NHL team has played in the venue since 1988 when it was used for the Winter Olympic games. The Flames have been managing the building since 1994 when it paid CAN$20 million to buy its lease. Calgary, Alberta - The president of the Calgary Stampede isn't banking on a new arena for the Calgary Flames on the grounds any time soon. Speaking to the 11th annual Calgary Real Estate Forum, Stampede boss George Brookman doused any notion of an imminent replacement for the aging Saddledome the Flames have been pushing for, noting while talks are ongoing, there doesn't appear to be any movement. The Flames are aiming to build a new facility on the Stampede grounds, meeting with city officials and looking at financing options in hopes of replacing the arena that was built for the Calgary Winter Olympics 25 years ago. While the Stampede is in the midst of a massive expansion to transform the 77-hectare swath of prime downtown land into a year-round destination, a new arena isn't in the equation. Ald. John Mar, whose inner-city ward includes the grounds, believes a new major arena will one day be in the cards, but it could be as many as 15 years before a ribbon is cut and the doors are opened. Mar met with Flames brass in the summer to hear future plans for a new arena, but he said he can't envision any plan that would include municipal taxpayers chipping in. Calgary, Alberta - The Calgary Flames say they want to begin construction on a new arena as soon as possible, but they have not established a timeline for the project. The team is talking with architectural and construction firms and expects to issue a request for proposals within the next four months. The Flames have said they want a new arena to allow the team to compete financially with other leading franchises. 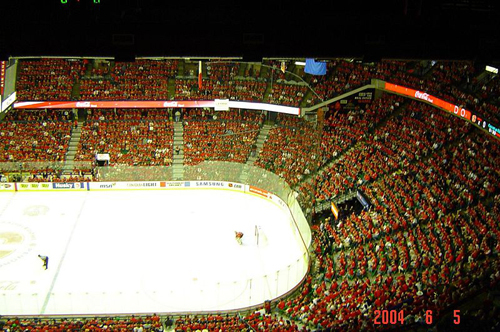 Although the team's lease on the Saddledome expires in 2014, officials said it can be extended on a short-term basis depending how quickly the arena is built. The Flames have identified two potential sites. One is on the Stampede grounds and the other has not been disclosed. 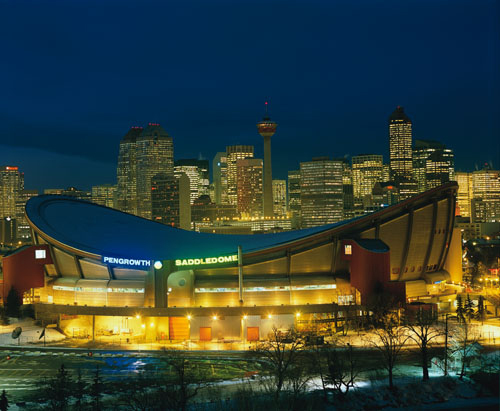 Calgary, Alberta - Opened in 1983 at a cost of $100 million, the Saddledome is now the sixth oldest in the league and Flames brass say the building is showing the strain of 26 years of housing a hockey team, musical acts and community events. Politicians agree a new building is needed, but say tax money won't be used to build it. Provincial officials did leave the door open for help with public transportation to support the complex, but not for the building itself. Flames president Ken King said his organization hasn't approached public sources for a handout, and any discussion about where the funding for a new facility will come from is premature. "We will make a presentation when and if we seek public funding. In what quantum and if that's going to take place has not been determined," he said. 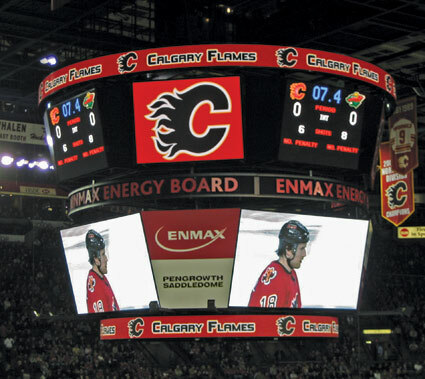 The Flames hope to break ground on a new arena within three to five years, although the team's lease on the Saddledome can be extended on a short-term basis beyond 2014. The club has identified two potential sites, at least one of which is on the Stampede grounds while the other remains unnamed. Calgary, Alberta - Officials with Pengrowth Management Ltd. say they may give up the naming rights sponsorship of the Flames' arena that they purchased in 2000. The sponsorship is up for renewal June 30 and officials say they are considering their options. The firm has separated from Pengrowth Energy Trust and is expected to undergo a name change to avoid confusing with its previous firm. Flames president Ken King has said the naming rights are of "enormous" importance as a stable source of revenue. The removal of the Pengrowth name from the Saddledome in Calgary, Alberta, is signaling a change of name for the building, according to the Calgary Herald. Team officials were mum on the issue, saying only to expect an announcement in the next few days. The Herald suggests the new name could be Scotia Bank Saddledome because an Internet domain is registered by a Flames- owned company. The current naming rights deal expired in June. Calgary's Saddledome has been renamed the Scotiabank Saddledome after naming rights were sold to the firm in a 10-year deal, according to the Calgary Herald. Other terms were not disclosed. The previous deal with Pengrowth expired in June.